A treatment course for many traumatic brain injury (TBI) patients involves drilling a hole in the cranium to measure cranial pressure and to administer medication. What is astonishing about this procedure is that the tool of choice is a manually-powered drill where the operator must drill through the patient’s skull and retract the drill at the proper time to avoid “plunging” — the drill bit is accidentally driven into the delicate brain tissue. must be a hand held portable design. The first generation safety drill used a dynamic bi-stable mechanism that supported drilling when force was applied to the drill bit tip, but would retract into a protective sheath when the force dropped (i.e. upon penetrating the skull). The bi-stable mechanism operates by a force balance between the reaction force due to drilling and centrifugal forces due to rotating masses as shown in Fig. 1a. At the moment of penetration, the reduced reaction force causes the linkages to change from the drilling position in Fig. 1b to the collapsed position in Fig. 1c. This first generation device demonstrated passive drill retraction, but had one drawback in that it had to maintain a minimum rotational speed to generate centrifugal forces large enough for drill retraction. Fig. 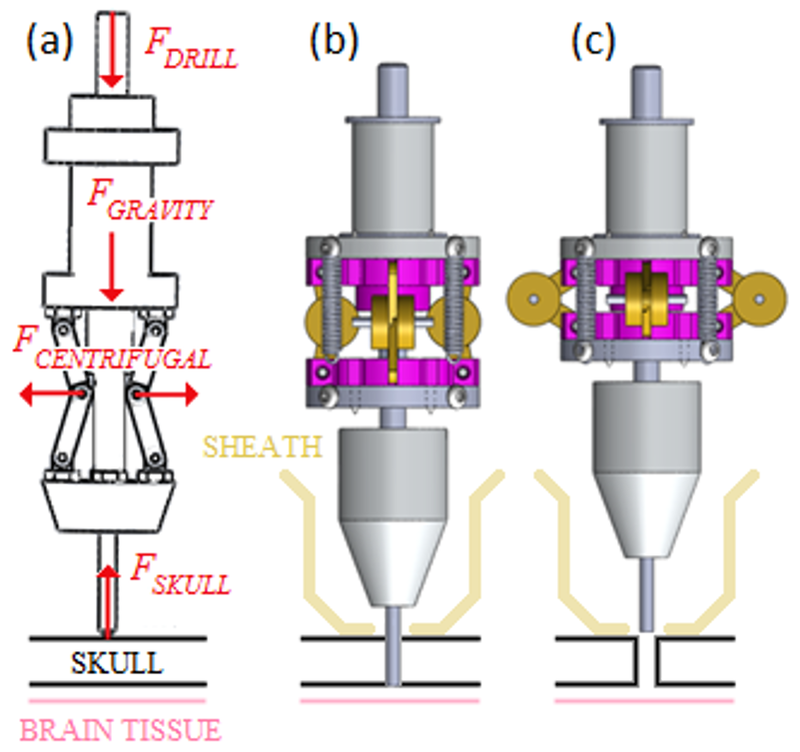 1 – Centrifugal drill bit retraction design with (a) force diagram, (b) drilling position, (c) collapsed position. 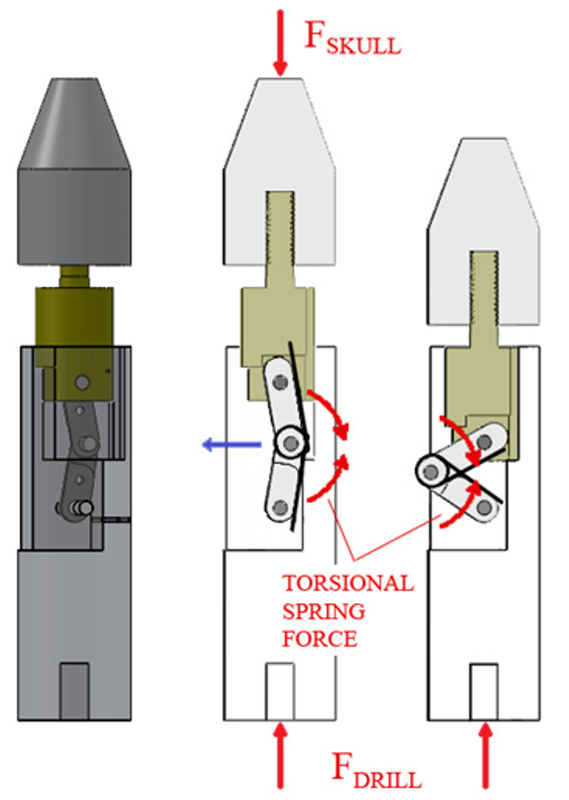 I came onto this project to lead the design of the next version where we overcame minimum rotation speed requirements by replacing the dynamic bi-stable mechanism with a single-linkage mechanism preloaded to collapse with a torsion spring (see Figure 2). In this the design, the user loads the drill bit in place (reloader mechanism not shown) and applies pressure with the tool against the bone. The combination of forces from the bone and the user keep the linkage constrained in the position (Fig. 2b). 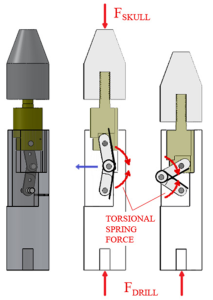 When the drill bit penetrates the skull, the torsion spring folds the linkage as in Fig. 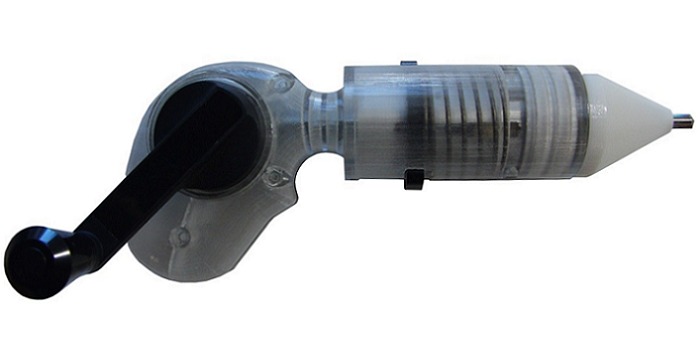 3c, therefore retracting the drill bit inside the protective casing. If the user loads the drill without pressing the tool against a hard surface, the linkage will automatically retract itself. This increases tool safety by making the retracted state the default position. Fig. 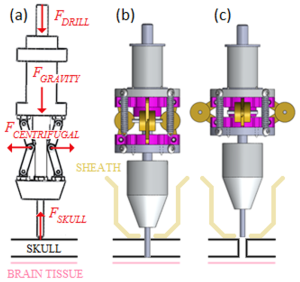 2 – Bi-stable drill bit retraction design with (a) simple rendering of design, (b) drilling position, (c) collapsed position. Inside view of prototyped bi-stable design.